Investment Corporation of Dubai (ICD) unveiled plans for a US$1.4 billion Royal Atlantis Resort and Residences with a design that is set to dominate the Palm skyline and set architectural tongues wagging.The New York-based architecture firm Kohn Pedersen Fox Associates, which is behind Abu Dhabi’s Midfield Terminal, is designing the building. London-based GA Design has been appointed to do the interiors. The modernist design of glass and stacked blocks with overhangs and sky gardens is in sharp contrast to the surrounding buildings and the adjacent Atlantis hotel. Dubai became a playground for architectural designs before the property market collapsed in 2008, which led to many practices retrenching and withdrawing from the Emirates. But the revival of the real estate sector has encouraged many architects to return to the city, which next week will host its annual Cityscape exhibition where many will be displaying their designs. 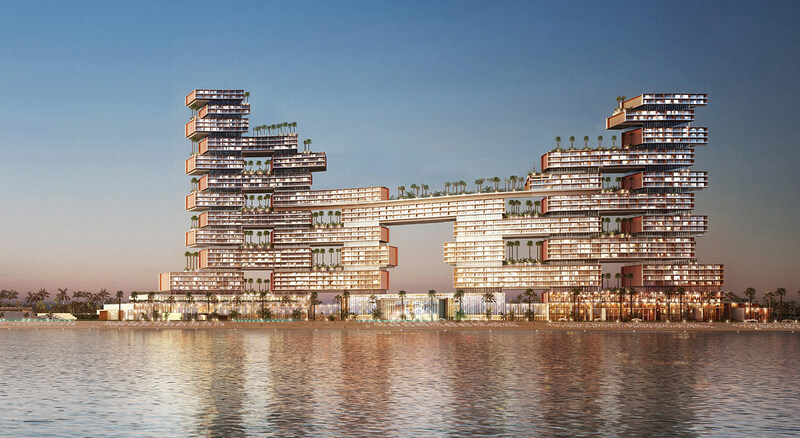 The 800-room hotel managed by Kerzner International will rise to 46 storeys on the waterfront with a pool 90 meters above the ground on the crescent of the man-made island near the existing Atlantis the Palm Resort. The project will also include 250 luxury residences and retail offerings. The property is scheduled for completion by 2017. The announcement of Dubai’s second Atlantis comes after the US hotel operator Marriott revealed in July that it will take over the management of the first Atlantis hotel in the Bahamas from the end of the year. It will rebrand the 3,400-room property owned by Canada’s Brookfield Asset Management under its Autograph Collection.